In celebration of the 100th anniversary of the founding of William E. Coutts Co. Ltd, from which sprang today’s Hallmark Canada, Hallmark Art Collection presents a special exhibit of works by prominent Canadian artists. Many of these paintings and prints were collected over the years by William E. Coutts, who, in 1916, founded the Toronto-based greeting card company that would become Coutts Hallmark, and, eventually, Hallmark Canada. Over the span of decades, Coutts generously supported Canadian artists with scholarships and awards, as well as commissions for numerous card designs. His company’s popular “Painters of Canada” Christmas card series have been in production periodically ever since the early 1930s. This selection of works, which are now part of the Hallmark Art Collection, provides a vivid cross-section of Canadian landscape painting at its finest. Among the artists included are Alex Colville, Nicholas Hornyansky, Alexander Young (A.Y.) Jackson and James Edward Hervey (J.E.H.) MacDonald. This is the first time many of these works have been exhibited in the United States. The art is supplemented by vintage photos and historical ephemera from Hallmark Archives. O, Canada! is on display now in the Hallmark Art Collection Gallery at Hallmark Visitors Center in Kansas City, Missouri through February, 2017. 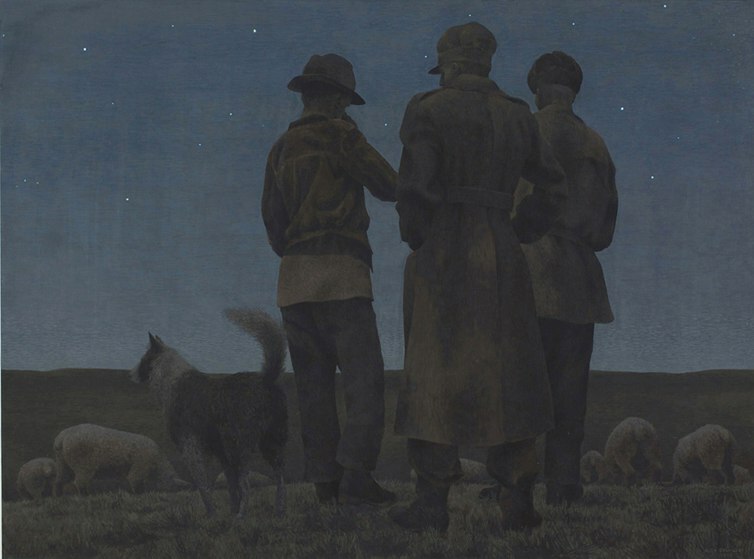 Alex Colville's tranquil Three Shepherds from 1955 (detail).